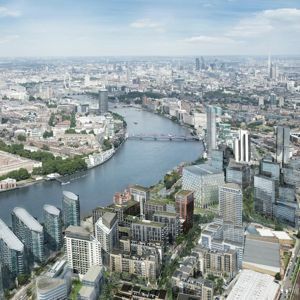 Wandsworth Council has approved plans to build a new £40M bridge over the River Thames which would provide a new sustainable transport link in south west London. Wandsworth Council is looking for an architect to design the bridge and says an international competition could get under way later this year. A shortlist would be selected in early 2015 and the winning design announced in spring the same year. The final designs would need planning approval from Wandsworth and Westminster Councils, and sign off from the Mayor. The new pedestrian and cycle crossing is intended to connect the rapidly developing Nine Elms district on the South Bank with the historic Pimlico embankment to the north. Although the exact location of the bridge is yet to be confirmed, the preferred options are close to the site of the new US Embassy. The bridge is part of a £2Bn infrastructure package transforming Nine Elms into a new Zone One transport hub complete with two new Northern Line tube stops. A TfL feasibility study confirmed the bridge would carry around 9,000 walkers and 9,000 cyclists a day – proving a car free alternative to Vauxhall or Chelsea Bridge. Wandsworth Council leader Ravi Govindia said: “This will be a new bridge at the centre of the world’s greatest city so the design standard has to be exceptional. “It must work alongside the cutting edge modern architecture of Nine Elms as well as the elegant buildings on the north bank. There will be engineering feats to overcome and the landing points on both sides must integrate sensitively and effectively with their surroundings.